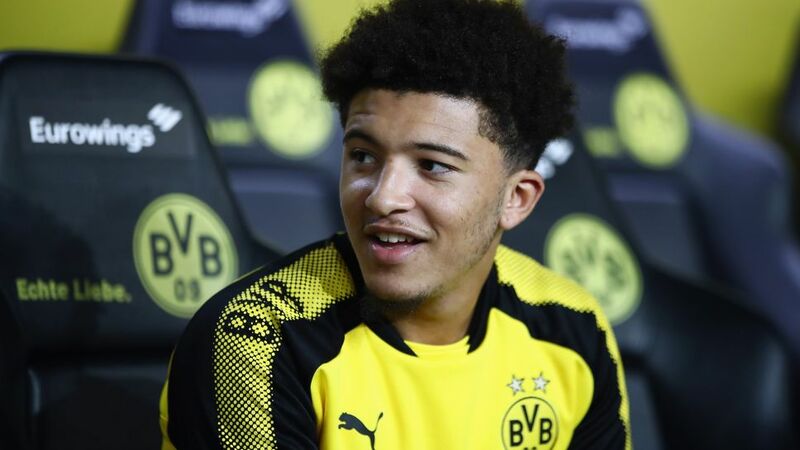 English teenager Jadon Sancho is living "a dream come true" by playing for Borussia Dortmund, the U20 World Cup winner has revealed. Sancho, who is set to return from injury at the start of March, rejected the offer of a contract with English Premier League leaders Manchester City to join Dortmund last summer. City were bitterly disappointed to lose the teenage talent, but Sancho, who turns 18 next month, has had no reason to regret his move. Six Bundesliga appearances - three of them starts -have given him a taste of life with one of Europe's biggest clubs, and the youngster cannot get enough. Watch: Hear what Sancho had to say after his first Bundesliga start! "To play for the first team, in front of the yellow wall, is a dream come true," Sancho told BBC Sport, who relished the challenge of taking up the number seven shirt vacated by Ousmane Dembele. "I would have taken any number but getting seven was a big boost to my confidence. It doesn't faze me. It is about coming here and proving myself. That is why I am here." Sancho's determination to establish himself in Germany is clear. He is learning German studiously, and has his father living alongside him in a bid to allow him to concentrate as much as possible on his game. That focus was already clear in the regular, gruelling commutes he would take across London to play for Watford's youth academy before moving into the Premier League club's dormitory for aspiring pros aged 12. "It was hard being away. Really hard," reflects Sancho, a friend of fellow English players Reece Oxford at Borussia Mönchengladbach and RB Leipzig's Ademola Lookman, who have also made the bold step to move to the Bundesliga. "But you have to do what you have to do if you want something so bad." That drive remains intact, and Sancho still watches YouTube videos of his idol Ronaldinho in a bid to learn and perfect the moves the Brazilian former Paris Saint-Germain, Barcelona and AC Milan star used to terrorise opposing defences. A stellar season with BVB could also help him achieve another goal: playing for his country. With Manchester United's Marcus Rashford as the example to follow, Sancho is even being whispered about in terms of being an outsider for a place in Gareth Southgate's 2018 FIFA World Cup squad. "That is a big one," said Sancho, who has previously featured for England at Under-19 level. "I would be honoured if they pick me."